← Fr. Werenfried van Straaten O.Praem. Today in our Order we commemorate St. Frederick. Frederick Feikone was the son of a poor widow from Hallum in Friesland. His priestly vocation was already noticed in his early years and his pastor gave him his first Latin instructions. He studied the liberal arts and the Holy Scriptures at Münster. Frederick had a special devotion to the Blessed Virgin Mary, St. John the Evangelist, and St. Cecilia. Returning from Münster, he became a teacher and was ordained a priest when he was old enough. He was appointed assistant priest to the pastor of Hallum whom he later succeeded. Frederick wished to build a hospital and asked bishop Godfrey of Utrecht (1156-1177) for permission to establish a monastery of canons after the death of his mother. Thereafter he went to the Norbertine abbey of Mariënweerd to learn as novice about the monastic life. Afterwards he wandered through cities and villages to gather companions. In 1163 he built a monastery church dedicated to the Blessed Mother: “Mariëngaarde.” At first the priests and nuns lived in the same establishment but soon the sisters moved to Bethlehem. He then went to Steinfeld in order to join the foundation to the Norbertine Order. Frederick remained abbot, pastor of Hallum, and rector of Bethlehem all at the same time. A seminary for educating priests was attached to the abbey and became famous in a short time. 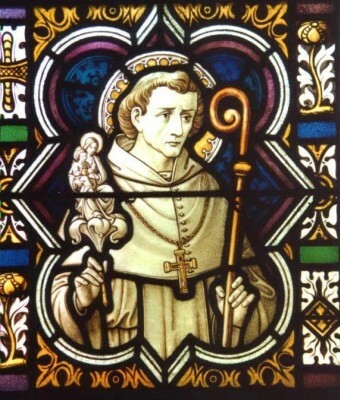 Frederick became ill while at the Norbertine convent of Bethlehem and returned to Hallum. In the church in which he had celebrated his first Mass he also celebrated his last. After the Mass he returned to the abbey to die. He said to his confreres, “Pray for me, because I could not care for the poor as much as I wished since the monastery was so poor.” He urged them to follow the Rule and assured them that he would never abandon his confreres as long as they would remain faithful. He died on March 3, 1175. So many miracles occurred at his grave that the church of Mariëngaarde became a much-visited pilgrimage site. In 1614, during the rule of the Calvinists in Friesland, Abbot Nicolas Chamart took his relics to Bonne-Espérance where they were entombed in the abbey church in 1616. During the French Revolution they were taken to Vellereille, and in 1938, during Abbot Bouvens’ term, to Leffe in Dinant. Pope Benedict XIII approved Frederick’s cult on January 22/March 8, 1728. His feast was transferred from the day of his death since this date often fell in the season of Lent. Grant, we beseech You, Almighty God, that poor in spirit after the example of Your abbot St. Frederick, we may imitate Him who handed Himself over for the salvation of the world: Jesus Christ, Your Son, Who lives and reigns with You in the unity of the Holy Spirit, one God forever and ever. Amen.